It was 4am, Friday morning, June 14th. My hands and the kitchen floor were covered in DOT 4 brake fluid and in 12 hours I was supposed to be in Jackson, Wyoming to pick up Nik. I had been trying to bleed my brakes for what seemed like an eternity. As I pulled the brake lever to the bar I cursed to myself and decided to call it a night. Montana and Wyoming had been a little wet in the preceding weeks. My last couple of forays into the mountains had ended up with me ankle deep in mud. Nik and I decided that it was time to get out of our respective towns and head for dryer ground. I was supposed to leave Bozeman at 12:30 in order to be in Jackson by four to pick Nik up from work and head to Deer Valley Ski Resort in Park City, Utah. I know that riding lifts to mountain bike is an anathema to many mountain bike purists and one does miss out on some of the finer things of mountain biking; scenic vistas, being way out in the middle of nowhere with no one else around, and the satisfaction that comes after a long climb, but I’ll give all that up once in a while for two days of downhill madness. When I awoke Friday morning it felt as if I had been rubbing my hands with sandpaper. Apparently brake fluid isn’t a recommended moisturizer. I threw the bike clothes in the wash and spent some time trying to get my apartment in some kind of order. The clothes were done around noon so I threw everything in the car and praying that I didn’t forget anything, I hit the road. Four hours later I was standing at Nik’s front door. I broke it down for him. There was no way we could reach Park City before dark and considering that I still hadn’t successfully bled my brakes, I didn’t think we would get there before midnight. Rather than searching in the dark for a place to stay, I thought that we should stay in Jackson that night and leave the next morning at the crack of dawn. He concurred and we set about repairing my battered bike. Not only did the front brake not work but also the bottom bracket had developed a dangerous amount of play in it. Luckily Nik had just replaced his drivetrain and his old bottom bracket was in good shape. On to Wilson Backcountry where for a couple beers we were able to use their tools and bike stands. Nik is a skilled mechanic and so the bottom bracket swap and the brake bleeding were done with little trouble. To be fair I was bleeding my brakes correctly and only making one little mistake. When I drained the runoff tube coming out of the master cylinder, it acted like a siphon pulling out just enough fluid to muck up the whole system. When everything was fixed we did a little urban assault around the Teton Village to test the repairs and then it was off to bed because we had an early morning. Up with the sun and with only a brief stop for some excellent breakfast burritos we made it out of town by seven. What a beautiful sight it was with the sun rising over the mountains, zero traffic, and two Bullits on the roof rack as we roared down highway 189 at 100 mph. Four hours later we were pulling into the Deer Valley parking lot. After signing the release form and getting our wristbands we made our way to the lifts. There were a lot of big bikes and people in full downhill gear. The first run we did was called Aspen GS or some other silly name. To put it succinctly, this trail sucked! The trail was on a decent descending grade but there were switchbacks (the GS turns from which the trail got its name I guess) that actually went up hill. It was the first downhill climb I have ever been on. I was very disappointed and was beginning to wonder if I had wasted my weekend. Thankfully the trails got better. 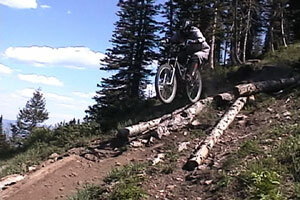 We did another one of the “Aspen” trails, this one called Aspen Slalom. 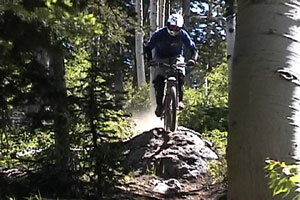 This had some nice singletrack in the aspen trees with lots of tight turns. We connected it with Freestyle, which was a nice cruiser trail that traversed back and forth on the hillside with a few sharp switchback turns. 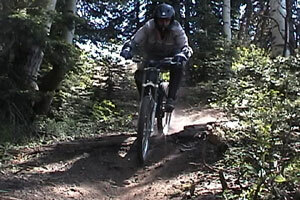 Sharp turns are a characteristic of all the Deer Valley trails I think. It has a nice technical 2-foot drop that looked easy from above, but had a sharp right turn immediately following it that proved to be a little tricky. The next trail we did was Thieves’ Forest. It was very technical at the top with tight turns and rock jumps that had very small landings. I flailed a bit at the top but found my groove in the middle. Some of the turns were a little rutted out due to people locking up big tires on a daily basis. Many turns required the rider to stuff their wheel in the rut and hang on for dear life. Maybe not ideal but still fun. Fireswamp was a lot like this trail. 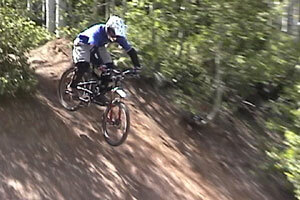 It was the Utah State Downhill course and its turns had the scars to prove it. Despite this the trail was very fun. A little more technical than Thieves’ Forest, it had more jumps and a fun little log ride. At one point you were bombing across a field only to have the trail dive into the trees with incredibly tight singletrack and a couple of turns that were very difficult not to blow out of. These trails merged into one near the bottom. It had some fun steep drop-ins and a fast, scary logging road that had only one narrow line because of all the rocks on it. These two trails were very demanding and would not be enjoyed by everyone especially if they were on a hardtail, but I think that everyone would agree that Homeward Bound is a fun trail. It had more classic singletrack that started with tight, banked curves through a rock-strewn field. It rolled past a man-made pond that I guessed was used for making snow and entered the trees. 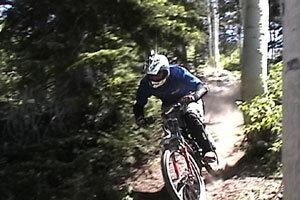 There the singletrack got narrower and straighter as the trees flew by in a blur. It dumped us out onto a logging road that took us back to the lift. Day two was much of the same but with cameras. When Nik and I had ridden in Pipestone, MT earlier in the season, we had been pretty evenly matched with both of us sharing the lead with Andy. Since then Nik has found his flow and I spent the weekend eating his dust. While doing the follow cam in the tech sections he almost ran into me a couple of times. Funny, yes but not that good for my ego. 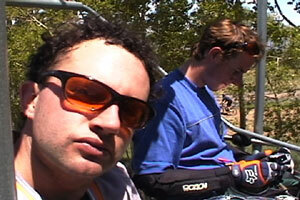 After I got over my self-esteem issues we had great day riding and filming. We rode until they wouldn’t let us on the lift anymore and then packed the stuff into the car and were on the road once again, albeit a little slower than the day before.